I agree...it's not Christmas until the sugar cookies are made ! I can't wait to make mine. Yours are just precious !! They look beautiful, and I totally agree that these say "Christmas" more than any other treat! I bet that your family and friends are all happy that you've revived this tradition! Love traditions! Love stars! Great job, glad you liked them! I sliced mine thicker as well, I don't like crispy cookies. And sugar cookies practically scream Christmas, and they are my husband's favorite too! How pretty and simple...and how great that you're carrying on that tradition! They look so pretty! We end up making sugar cookies for almost every holiday. I blame my son who is crazy about them. I did mine with orange. I love the stars!! Nice work! Won't the boys have fun with them? Love the lemon glaze! 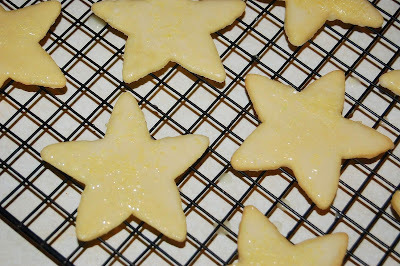 Oh, I love the stars and the lemon glaze sounds perfect for those...thanks for including the glaze recipe. Am so doing those this season...great idea! We used to always decorate sugar cookies as kids as well. Last year I didn't make them but seeing all these great recipes, I think I might have to make them this year! There's NO TELLING what those kids will come up with. Think I'll borrow your idea for Christmas with the nephews. I am on a constant search for a good sugar dough recipe so I am excited to try this!! So perfect, they seem to be flotting on air! WOW! Beautiful, Anne! they look great! the glaze is so nice and shiny. yum:) i thought the dough was delicious, too... couldn't stop eating it! Sugar cookies just say Christmas. Yours came out beautiful. the glaze is a great idea! My husbands family used to do these as a tradition, too, but he made such a big ugly mess of the icing every year, they finally stopped. Go figure. Kudos to you to keep a nice thing going - and these look great! My dh just volunteered me to make a bunch of cookies for his job...so he can hand them out. This recipe will be on the top of my list...I so love that cook (bake) book! Thanks for that lemon glaze recipe, I'm going to have to try it! I like my cookies thicker as well... yours look absolutely beautiful! Your stars are fabulous! I love a lemon glaze but was too lazy to glaze mine! Very fun. We'll be "stuck" in UT this year for Christmas. Not looking forward to the cold!! You just have to have sugar cookies for Christmas! I can't wait to make these. Love the star shapes. I am sure those "scouts" will gobble them right up. Glad you liked them, they are so easy to make. I like your star shaped version. Thanks for baking with me and TWD. These look lovely and the start of Christmas!!! 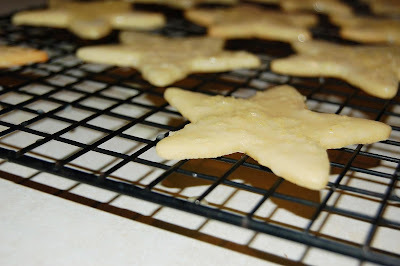 Sugar cookies are one of my husband's favorite types of cookies. I always make some this time of year just for him. It's not Xmas without sugar cookies. I am such a good wifey-poo.